Roskill consulting firm have produced quality metals market reports for many years now. Their reports are read by thousands of investors worldwide. 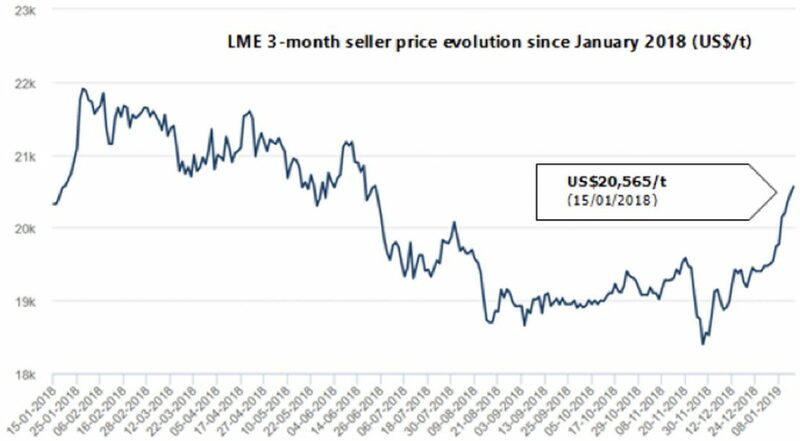 On Friday, they highlighted how the London Metal Exchange (LME) three-month tin price is facing an uptrend already in 2019. The price of tin has come back to over US$20,000/t for the first time since late July 2018. Comparatively, macro LME tin stocks had previously been maintained at record low levels since Q2, 2017. In Roskill’s view, this positive uptrend in tin price may have multiple contributing factors, and could even be partially the result of a “reflex to growing US-China trade hopes after official talks in recent weeks”. A number of other metals, including zinc and lead, also rose. Importantly, Roskill states that “tin was singled out as the market most impacted relative to its size in a 2018 Massachusetts Institute of Technology study commissioned by Rio Tinto”. Read the full Roskill article here. Figure 1 – Courtesy of London Metals Exchange (LME).